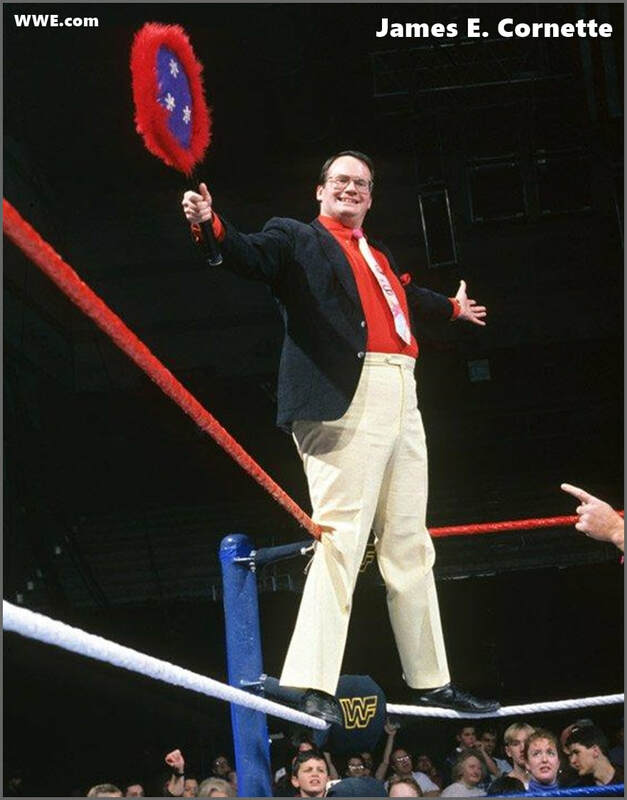 January 5, 1998, Jim Cornette cuts a promo in the ring announcing he is bringing the NWA (National Wrestling Alliance), and with it, "real wrestling" to the WWF (World Wrestling Federation, now WWE). In the ring with him is Dennis Coralluzzo and Howard Brody. Cornette announces a match to crown a new NWA North American Heavyweight Champion. It takes place between Barry Windham, who was still teaming with Bradshaw as The New Blackjacks, and Jeff Jarrett, who had recently returned to the WWF after a run in WCW (World Championship Wrestling). Jeff Jarrett wins after Jim Cornette hits Windham in the back with his racket. Later came NWA World Champion Dan Severn, The Rock 'N' Roll Express and The New Midnight Express. Windham eventually turned on Bradshaw and joined the NWA side of the invasion. Now, as a side note here, Bradshaw is a former NWA North American Champion, and would compete for the title on RAW. Another side note, the episode of RAW this aired on, was taped on December 30, 1997. The invasion never really got off the ground, but, this is a fantasy piece, where anything can happen. Imagine, if you will, that the invasion was booked differently. (By somebody else besides Vince Russo) imagine if the NWA Invasion did get off the ground, and actually was a good deal for everyone involved, including the NWA, which at that time was considering closing down, because financially it wasn't doing well at all! Now, here's my version of The NWA Invasion of the WWF in 1998. Jim Cornette is in the ring with two mystery guests. "Ladies and Gentlemen, for weeks now I have been speaking the truth about the wrestling industry. The industry I used to love, but has now turned into a sideshow act, a freak show. Well if I want to see a freak show, I'll go to a "real" freak show. This is professional wrestling. So I have taken it upon myself, to bring "real wrestling" back, and it begins tonight. Let me introduce my guests, Dennis Coralluzzo, and Howard Brody, and together they run the most historic, prestigious, wrestling organization in the history of this business, the NWA, National Wrestling Alliance! Now, as you can see, Dennis is holding the championship belt in his hands, and I'm sure you all are wondering why! Well, he's holding this championship in his hands, because tonight is indeed an historic occasion! An occasion so historic, we had a new title created! Tonight we crown the first ever NWA American Heavyweight Champion!" A match took place to crown the first ever NWA American Heavyweight Champion. Which, in reality, during the territory days, was used in Texas, but this is the first time, on a national level. Not to mention, first time on WWF television. NWA American Heavyweight Championship: Jeff Jarrett beat Barry Windham after Jim Cornette hits Windham with his tennis racket! Jarrett wins the title. "Last week was just the beginning! This week, I, Jim Cornette, have another surprise! Ladies and Gentlemen, Ricky and Robert, The Rock 'N' Roll Express!" Indeed, the Rock 'N' Roll Express make their way down the aisle! When they enter the ring, Jim Cornette, Dennis Coralluzzo, and Howard Brody present them with the NWA World Tag Team Championship. However, one team takes exception to this, The New Blackjacks. "Cornette, last week, you hit me in the back with your tennis racket, ad if you thought that was the end of it, you thought wrong! Now, since you are bringing these titles to the WWF, I hope your ready for some competition! Rock 'N' Roll Express, put those titles on the line against us and prove that you are as good as your big mouth says you are!" Exclaims Barry "Blackjack" Windham. The Rock N Roll Express beat The Blackjacks after Barry Windham turns on Bradshaw! Windham has joined the NWA. A week later, Jim Cornette announces that the NWA World Heyweight Champion, Dan Severn is here and he wants a fight. A challenger steps up: Vader. NWA World Champion Dan Severn beat Vader by submission! It's believed that Severn may have broke Vader's arm. The next week, the NWA compete in an eight man tag against four of the WWF's top stars. Dan Severn, Barry Windham, and The Rock N Roll Express vs. Ken Shamrock, Owen Hart, The Undertaker, and Steve Austin ends in a no-contest! Also that night, Jeff Jarrett defends the NWA American Heavyweight title. The following week Stone Cold challenges for the NWA World title. Steve Austin beat Dan Severn by disqualification. The Legion Of Doom beat The Rock 'N' Roll Express to win the titles! Cornette was furious at The R 'n' R Express for losing the tag titles. So, drastic times, call for drastic measures. "Loverboy" Dennis Condrey and "Beautiful" Bobby, The Midnight Express attack The Rock 'N' Roll Express. It's revealed later that in order to get Bobby Eaton, the WWF had to buyout his WCW contract. NWA World Tag Titles - NWA Rules - Over the Top Rope Disqualification and Etc. The Midnight Express beat The Road Warriors to win the NWA World Tag Team Titles! It's announced at WrestleMania, the NWA will compete in an eight man tag. It will be, Dan Severn, The Midnight Express, and Jeff Jarrett against Ken Shamrock, Vader (whose arm wasn't broken, but was out of action until WrestleMania), and The Rock N Roll Express. Team WWF beat Team NWA! The Next night on RAW, Jim Cornette speaks! "I tried to make a difference. I tried to bring back some integrity to this business, but I have let everyone down. I brought in all these guys but not one of them could get the job done. Well, I hope you're happy WWF! I hope you're happy Vince McMahon! And you know what? If this business wants a freak show, then it's gonna have to have it without me in it! I'm going home to Louisville Kentucky! I quit!" The NWA Invasion is over! Dan Severn stayed in the WWF a few more months before leaving. Windham served out his contract then went to WCW in 1999. Bobby Eaton returned to WCW a new contract for less money. Dennis Condrey wrestled occasionally for several years, but mainly he went on to train a new generation of pro wrestlers. The Rock 'N' Roll Express still occasionally wrestle to this day, and as for Jim Cornete, he worked behind the scenes for their developmental territory, Ohio Valley Wrestling, which he also had part-ownership of. He also had stints with TNA/Impact Wrestling and with Ring Of Honor. Today he has a successful podcast and continues to appear for independent promotions near his home in Louisville, Kentucky! Hope you enjoyed! Until next time, save me a ringside seat! What Could Have Been: Chapter Three. What Could Have Been: Chapter Two - Read Here.